(CNN) -- Last year Toro Rosso continued to emerge from Red Bull Racing's shadow in only their second season as an independent constructor. Based in Italy after being formed as a feeder outfit for Red Bull from the ashes of the former Minardi team, Toro Rosso's main aim has been developing young drivers. Having aided the early career of Red Bull's double world champion Sebastian Vettel, the team will this year again promote young talent, lining up with two drivers starting their first full seasons in the sport. 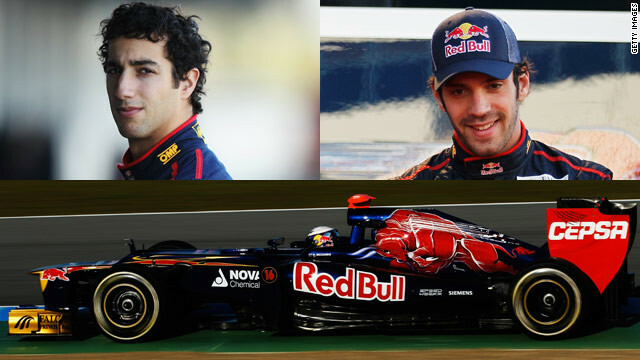 That means no race seats in 2012 for 21-year-old Spaniard Jaime Alguersuari and 23-year-old Swiss Sebastien Buemi, who were both dropped after more than two seasons at the helm. After finishing last year well clear of the strugglers, Toro Rosso will want to make up further ground on the mid-ranked teams this time. The Australian made his F1 breakthrough in 2011, spending the second half of the season racing for HRT after making his debut at July's British Grand Prix. The 22-year-old's highest finish during his 11 races with the Spanish team was 18th, achieved in Hungary and India, while he was forced to retire in Belgium and Abu Dhabi. Ricciardo won the Formula Renault series in 2008 and the British Formula Three title in 2009, but he will find the competition tougher at the highest level. The young Frenchman was given the chance to drive Red Bull's championship-winning RB7 car during November's young drivers test, and he will have a car of his own for the 2012 season. Vergne finished second in last season's Formula Renault 3.5 series, three places ahead of his new teammate Ricciardo. The 21-year-old clinched the British Formula Three title the year after Ricciardo, and took part in several F1 practice sessions at the end of 2011.